I have been a Baha’i for basically my entire life. My mother has been a Baha’i my entire life, therefore I was raised using the principles of the Faith. 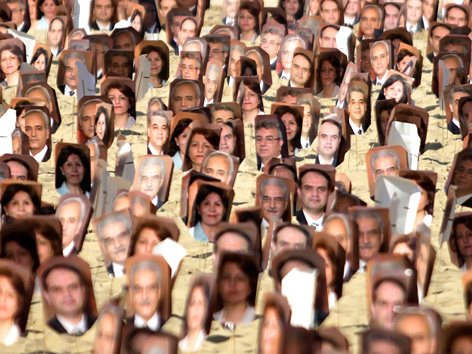 I have, as most, always been moved by the stories of the martyrs, but it wasn’t until the arrest of the seven Baha’is in Iran, and hearing about the issues with education, the loss of the cemeteries, as well as the inability to even bury the dead that it truly became real to me. It might have been a matter of my own maturity, or the unrest in the world that is mentally, physically and socially affecting my country, but I was finally taking aspects of my faith not only more seriously, but more to heart. I never expected the extreme sadness, personal feeling of loss, anger, and disappointment in my inability to take action that has overwhelmed me in the past few years. The last few years I was taking classes towards my Master’s degree in Art Psychotherapy so I was able to attempt to focus my attention on my studies, though my thoughts were regularly with students who were being denied not only higher education, but basic education. I realized how lucky I was, and how the treatment the Baha’is has become more unfair. At one point I was taking a creative writing class on prose poetry. I found myself writing poems about the Faith as well as my thoughts and feelings about my beliefs. My prose poem, Yaran Revolution, encompasses my sadness and anger at not only the Iranian government, but societies that follow and condone the awful treatment of the Baha’i communities in all of the countries where discrimination is happening. Reading about how Baha’is have been killed, imprisoned, and deprived of jobs, education, and the freedom to worship has motivated me to want to revolt. There are people, though strangers to me, who are suffering. Suffering in the name of religion. People have led revolutions for humanitarian reasons for centuries. I began to feel that the Baha’is need a revolution. Baha’is being non-violent, electing non-combat positions when serving their countries in the militaries, are not going to lead any sort of military or civilian coup. I do feel that we need to find ways of starting a verbal revolution, because things need to change. This poem is in direct response to the plight of the Yaran, it also is in remembrance of all the Baha’is who have suffered at the hands of their governments and their communities. This is my part in the revolution. The majority group believes it speaks for the majority of people. Dictates spewing forth from their mouths like bats from a cave at the last light of day. Self-proclaimed leaders swooping down from their self-proclaimed heavens, telling people what was written and what the Unknowable One, God, meant. Using the power bestowed by the powerless to decree how to live, how to worship, how to be. Using the power to benefit themselves; bidding their followers to tailor their costumes of supremacy, costumes made of hidden agendas and pretenses, golden threads made of lies running through cloth, shimmering like water reflected lights. Those who follow do so like the proverbial lemmings off the cliff’s edge: no independent thoughts, no independent actions, no independence. Those who investigate, who remain objective, who look for their own truths, do not succumb to the siren songs of those who bask in their own glory. They find alternate paths winding from words to works, leading to truths, to incomparable peace, to beliefs with foundations as solid as the stone which held Excalibur. Yet the self-determining ones find themselves drowning in a river of sputum from those who hate all those who dare to think. Hate, vomited up after feasting on the inaccuracies and lies fed to them by their superiors. Hate, used against all who dare to question their path. Hate, used against all who dare to follow their own. These thinkers, these believers are do-gooders, faithful, friends. They make a point of using their paths to benefit mankind, to increase the moral fortitude of humanity, to strengthen threads of love between peoples of the Earth. For their love, for their faith, for their strength, believers are persecuted. Businesses lost. Families torn apart. Refused educations. Beaten down to their knees. Forced to bear the stings of slurs. Even in death, they are forbidden peace. Dragged into prisons, given no reprieve, shown no mercy, afforded no justice. Believers sit quietly amongst the thieves, the murderers, and the assorted bad of the country. Teaching, without saying a word. Showing love to the imprisoned, showing love to the jailers. Threads of friendship form between all who hear of their plight; golden threads forming bonds of solidarity, invisible to eyes and unbreakable by hands, yet shimmering to the souls, and winding from person to person. Linking the Yaran to each other, to the believers in the country, to the believers in the world. Whilst feeling the pain of families and the pain of the wronged, the free unify. “Stand strong” the believers call out. Prayers arise, the only known battle cry for revolution. Prayers sent out to comfort, to strengthen, to enlist all under one banner. Songs and prayers calling for the trusting to trust in the All-Mighty. To accept the sufficiency of the All-Sufficing. For the free, the songs of praise issue forth fervently, at the tops of their lungs. For the Yaran, the songs of praise issue forth fervently, in silence.